Frodsham Silver Band has been together since 1907 when it was then called the Frodsham Subscription Band. The next of the photos was taken in 1909 and has 3 members from the same Hopley family as Chloe Hopley, one of our horn players. Mr Langwin is on the big drum and he appears to have press ganged his two sons into the party too ..nothing changes, eh? The uniform developed over the years, from flat caps and Sunday best, to a formal uniform complete with a hat and sash. By the time 1910 came, in addition to sporting some impressive moustaches, the band committee had grown to approx. the same size as the playing band. Thankfully today the band is made up exclusively of playing members, plus a few parents to help out. It is great to see the tradition of young musicians has been part of Frodsham silver Band since it earliest incarnation. August 2000 marks the date when the band “hit the high Note on TV”. We were featured on TV’s Songs of Praise coverage of the Saddleworth competition. Often described as ‘the greatest free show on Earth’, the Saddleworth & District Whit Friday Brass Band Contests take place every year on the afternoon and evening of Whit Friday – 29th May in 2015.From the earliest recorded contest in 1884, the event has grown in popularity. In 2015 well over a hundred brass bands participated in some twenty different contests at venues scattered around the moorland villages and towns on the western edge of the Pennines. Frodsham delivered a prize winning performance to finish in the top 3 at Greenfields? The event is free and open to the public. Just pick your spot and world’s finest collection of brass bands will pass right in front of you. The band concentrates mainly on engagements which are needed to fund the band, so we only have time to do a couple of contests a year. One such engagement is shown here in 1965, where you can see the band marching through Frodsham, on Church Street, photographed from the railway bridge. The band continue to go from strength to strength. It stays true to its philosophy as a fun environment in which everyone is welcome to come and enjoy music. 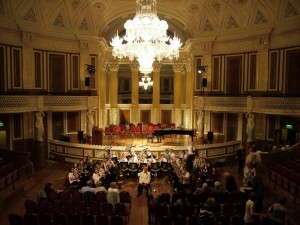 The success of this approach was seen in the invitation to play at St Georges Hall, Liverpool for a repeat of the Gala performance. 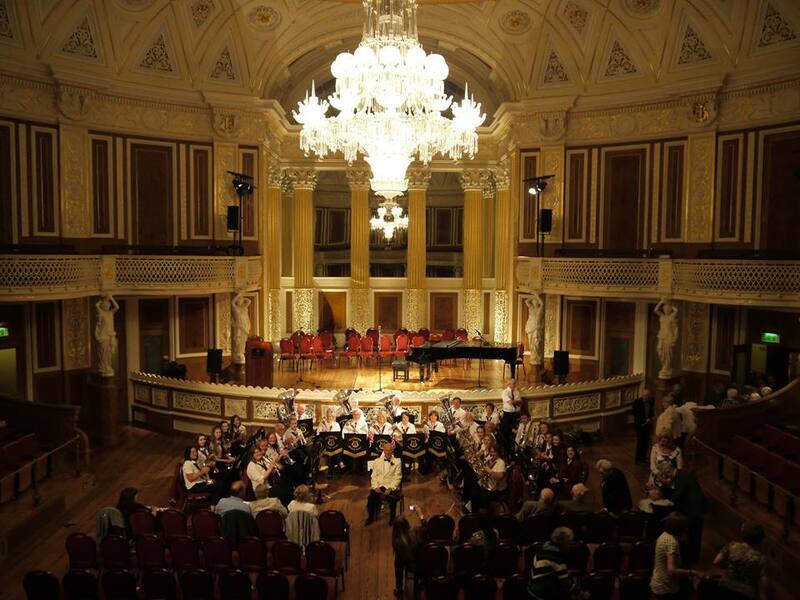 Charles Darwin once said “St Georges hall is the best place on the planet to listen to music.” I am sure he would have enjoyed Frodsham Silver Band!